How did Marshall became an institution in the world of live music? By building guitar amps that last, travel well, and play LOUD. 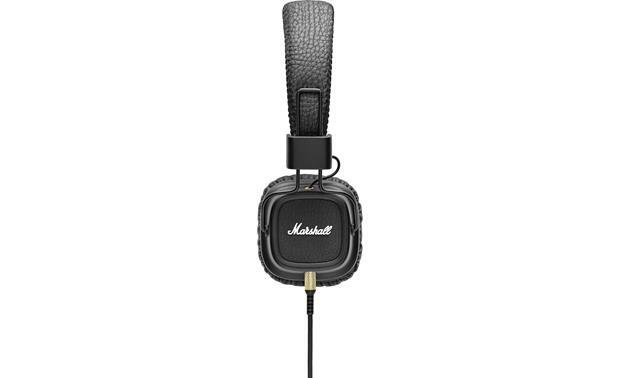 The Marshall Major II headphones live up to the family name. I was able to fold these durable on-ears at their sturdy plastic sliders and palm the 'phones with one hand. They felt light to carry and wear. Yet when I put on guitar virtuoso Gary Clark Jr.'s live album, the Major II's bass- and mids-driven sound was super heavyweight. 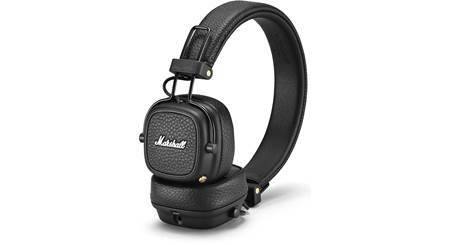 The Marshall Major II headphones (pictured in black) fold into a tight, travel-friendly bundle. 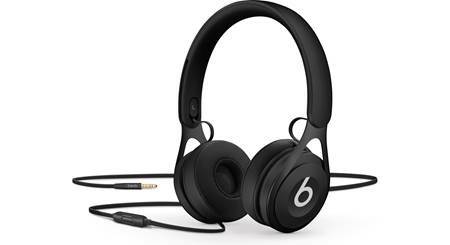 As I listened to the live version of "Catfish Blues," I jotted down, "man, these headphones bring the bass." But the lows weren't at the expense of the mids or highs. In fact, the hefty undercurrent of bass and percussion was a solid launching pad for Clark's soulful voice and soaring, next-level guitar riffs. The Major II headphones have an aggressive, "front-row" sound, for sure, but they were never muffled or distorted. 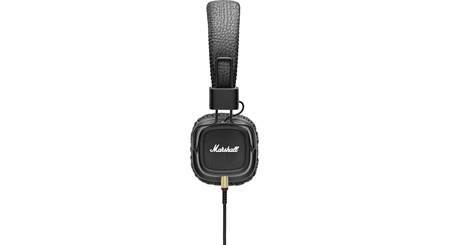 The Major II headphones feature iconic Marshall trappings. You can see it from a distance, but I really noticed them up close. 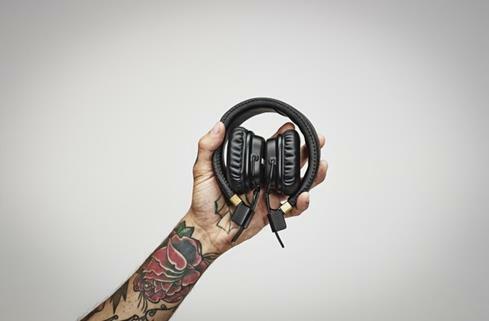 Even the detachable coiled cable features minplug connectors that are modeled after guitar plugs. And the famous logo is molded in raised, textured type on each earcup. I'll be honest, I worried the design might have gone too far with the square-shaped earpads. However, they were extra-soft and easy to get used to. Very little sound escaped thanks to the tight seal. Plus, once I got them situated, I didn't have to move them around or adjust at all during listening. Near the top of the cable, there's an in-line remote with a built-in microphone. It features a single button you can push to skip tracks and play and pause music. It works with an iPhone® as well as most models of Android™ phones. If a call comes through, leave the headphones on and just punch the button on the remote to take the call. Earcup Width x Height 2.575" x 2.653"
Cord Length 48" to 72"
Overview: The Marshall Major II on-ear headphones are solidly built, using handmade custom drivers, and soft ear cushions. It has a detachable coiled cord with an in-line microphone and remote for controlling your music and phone calls. The ear cups are hinged and fold in for storage or transporting. 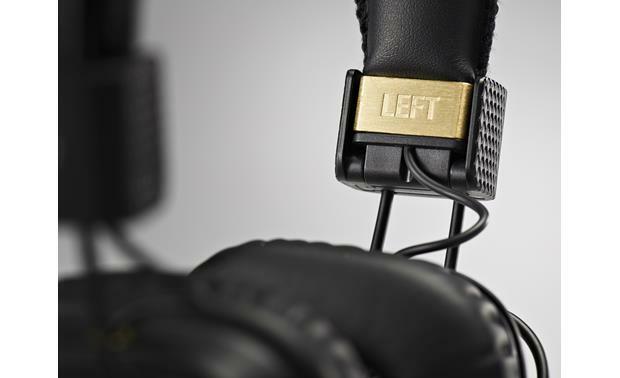 Drivers: The Major II headphones are equipped with large 40mm handmade drivers that feature a wide frequency response. 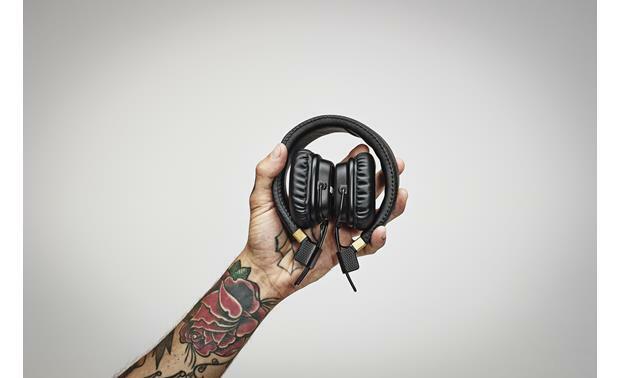 The headphones deliver deep bass and extended highs. 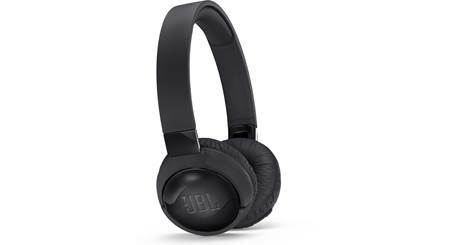 Cable/Remote/Mic: The Major II headphones have a detachable 48" coiled cable (that stretches to 72") with spring-reinforced stress relief where it terminates into a right-angled 3.5mm plug. The plug is narrow enough to be used with many smartphone cases. The cable features an in-line microphone and 1-button remote control. The remote is compatible with select Apple iOS devices (iPhone, iPad, iPod touch), and can control your music (play, pause, skip tracks forward/backward, fast forward/reverse) and phone calls (answer/hang up). The remote has limited functionality with Android devices. 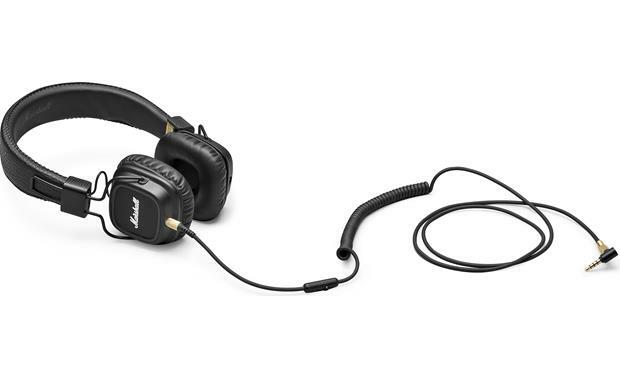 Dual 3.5mm Jacks: The Major II has a 3.5mm jack on both ear cups. This allows you to choose which side to plug in the cable. It also lets you plug in a second headphone to share your music with someone else. 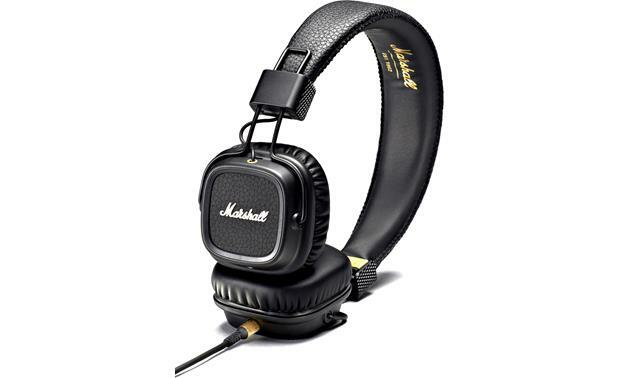 Searches related to the Marshall Major II On-ear headphones with in-line remote and microphone.